When asked by Gallup which professions are most trustworthy, people said: nurses, pharmacists, doctors, teachers, police officers, and clergy. The least trustworthy were: telemarketers, car salesmen, advertisers, congressmen, and stockbrokers. It's no stretch to deduce that salespeople are not widely trusted. This is ironic, since building trust is how great salespeople work, especially in the B2B software field where so many intangible factors are at play. When you have the customer's trust, you are far more likely to lock-out competitors, expand total contract value, and line-up repeat business than when you don't. 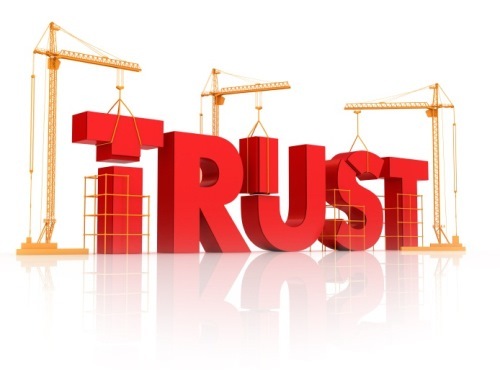 Might you be missing opportunities to build trust in your client relationships? The equation emphasizes the reinforcing nature of credibility and professionalism on one another and their impact on buyer trust. It also infers that trust increases indirectly to risk. Assuming this is a useful model for examining how buyers perceive a seller's trustworthiness, let's consider ways we can manage each component. Credibility is about understanding the client's business. Knowing industry trends, understanding the client's decision making process, and having deep knowledge of the company-specific applications of your technology will all heighten your credibility. Read Standard & Poor's Industry Surveys to study the industry definition, top competitors, current trends, and value drivers. Review the company's (and competitors') annual reports to find out about top strategies and goals for the year, as well as how historically successful they have been at attaining their targets. Use OneSource, Hoover's, or Yahoo Finance databases to discover how the company's performance ranks within its peer group. Find out how top companies drive performance. Be prepared to discuss success stories and case studies of other companies within the industry that are realizing benefits with your software. Are the top-ranked companies in the industry also your clients? Professionalism is judged by integrity and appearance. Although this is straightforward, you must be vigilant and consistent, as research shows that people need five positive experiences to erase a negative one. Keep your promises, show up on time, and be well-groomed and well-dressed. Give no one a reason to find fault with how you conduct yourself. Know your products inside-and-out, backwards-and-forwards. If you don't know what you're selling, they might not buy it. Despite your best efforts, you will encounter people who are quick to blame, nurse grudges, or espouse negative attitudes. Have a short memory of these people- don't get stuck in reactionary mode playing someone else's game. Remain upbeat and act from a constructive point of view. Risk is the perception that the client is making a good decision to deal with you and your company. It's widely-debated, but you can think of risk in emotional, political, and logical components. Does the client like you and your company? Work to be credible and professional. Make sure that your sales team is fully engaged in the sale. Can you help your client-champion clear the way for this project through the organization? Get to know other executives, managers, and opinion leaders. Discover what agendas and ongoing projects in the company could help or hurt this sale. Is there a strong need for your product? Help the client achieve the strategies and goals that are most important to them. Understand how to define the benefits of software and sell the software business case. To attract sales success, cultivate these elements in your client dealings and build trust of which any nurse, teacher, clergyman, and even car salesman would be proud. Where have you damaged the trust that clients place in you? How has that slowed down your sales progress? What will you do differently and what results could you get now?